Chinese and Asian patients who require eye surgery have special needs that Caucasian patients do not have to consider when thinking about undergoing eye surgery, particularly when the surgery is cosmetic in nature. Chinese eye surgery takes these special considerations into account when any conventional surgical or laser treatments are performed. 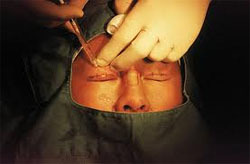 What is Chinese Eye Surgery? The amount and deposition of the fat layers are different in people of Asian descent and ancestry and treatments must allow and account for these differences. The number of Asian patients seeking assistance by eye surgeons has increased in the past fifty years. In China alone, there are reports that this type of surgery is now worth approximately $10 billion US each year. The practice is not limited to China or the Asian sub-continent. Surgery to correct or improve the appearance of the eyes and particularly the eyelids in Asian patients is now the most requested cosmetic eye surgery in many locations around the world. Chinese eye surgery is also performed on patients who have developed droopy eye lids or have prominent sacks under their eyes due to conditions such as a deformity in the tear duct tract. Patients may also seek help and advice for treatment of eye conditions of a more general nature that can affect anyone, regardless of their racial heritage or background. Treatment of eye conditions can involve surgical or laser intervention depending on the purpose of the treatment. The most requested surgical intervention is the creation of an eye lid crease on both eyelids. This procedure is commonly known as “the double eyelid operation” or Asian Blepheroplasty. The crease is created either by inserting stitches into the eyelid or creating a crease using laser and neither method requires cutting or incision. When a laser is used there is usually no bruising or discolouration meaning that a person can return to normal life responsibilities within a few days of undergoing the procedure. Treatments can also be performed for lower eye lids and can assist in creating a younger look for the patient. In most cases, these conditions are permanently improved by the treatments and the success rate accounts for their increasing popularity, not only amongst older people, but also amongst younger patients. Typically, the cost of surgery in the UK is similar to that of any cosmetic surgery performed by ophthalmologists and cosmetic eye doctors around the country. As cosmetic surgery is not covered by the NHS, a private consultation will be necessary. Many clinics such as Optical Express offer free initial consultations to patients and can advise on payment options depending on type of treatment required or requested. Some patients may prefer to attend the clinics of doctors who have had training and experience in this specialised form of eye surgery. Costs will vary but you can expect to pay on average approximately £400 per eye as a guide, though the final cost may be much greater.